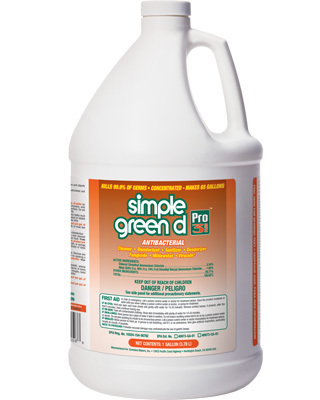 Simple Green d Pro 3 Plus is a hospital-grade antibacterial cleaner that features an extensive kill list of over 75 different bacteria, viruses and fungi, including antibiotic-resistant superbugs, providing protection against a wide variety of highly contagious and potentially deadly pathogens. The broad-spectrum, bloodborne pathogen compliant formula is proven effective against HIV, MRSA, Staph, E. Coli, Cold, Flu, Athlete's Foot fungus and more. Simple Green d Pro 3 Plus is a virucide, bactericide, fungicide and mildewstat with a high level of active ingredients to ensure performance. It is guaranteed to kill bacteria, viruses, mold, mildew and fungi, eliminate grime and remove odors. The non-acidic formula won't harm sealed stone, sealed grout or glazed tile like some other disinfectants can, making it ideal for all washable, hard, non-porous surfaces. High 1:64 dilution ratios make this antibacterial cleaning concentrate a cost-effective solution for use in virtually any professional facility. The broad-spectrum, bloodborne pathogen compliant formula is proven effective against HIV, MRSA, Staph, E. Coli, Cold, Flu, Athlete's Foot fungus and more. Simple Green d Pro 3 Plus is a virucide, bactericide, fungicide and mildewstat with a high level of active ingredients to ensure performance. It is guaranteed to kill bacteria, viruses, mold, mildew and fungi, eliminate grime and remove odors. The non-acidic formula won't harm sealed stone, sealed grout or glazed tile like some other disinfectants can, making it ideal for all washable, hard, non-porous surfaces. High 1:64 dilution ratios make this antibacterial cleaning concentrate a cost-effective solution for use in virtually any professional facility.